I'm beginning to think Jello is the dessert equivalent to Spam in Hawaii. There are more flavors of 3 oz. boxes jello at grocery stores in Hawaii (like Island Pineapple, Tropical Punch, and the regular Strawberry, Peach, Orange, etc.). My mom can do about 20 different things with Jello. 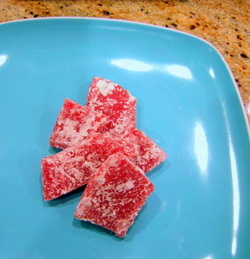 Some of it was kinda gross, like avocado jello, but this mochi recipe is a winner. I thought getting a microwave bundt pan might be a little tricky, but a quick search shows that silicone ones can be found at Walmart and Amazon, among other places. You can also buy a microwave mochi pan at Japanese stores like Marukai or Don Quijote. One thing to be aware of is the color of the Jello. While grape Jello-flavored mochi may sound great, it looks like concrete and no one will eat it. Stick to red, orange or green colored Jello. Dissolve jello in hot water and stir well. Add sugar, mochiko and vanilla and mix well. Pour into a microwave-safe 12-inch bundt pan that has been sprayed with Pam. Cover the top with microwave-safe plastic wrap microwave on high for 5 minutes. Take out, remove plastic wrap and cool completely. Flip mochi out from the pan and put it on a pre-dusted dish. Using a serrated plastic knife (like the kind that comes with plate lunches), slice into 1/2-inch wide pieces. As you slice, roll in katakuri and shake off excess.